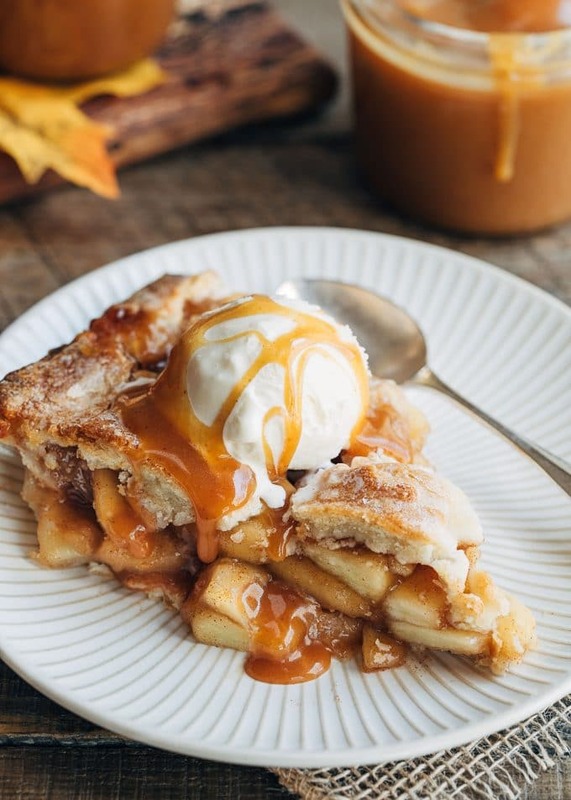 Take your fall desserts to the next level with homemade Apple Cider Caramel! 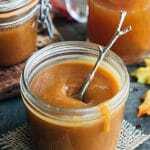 This easy-to-make caramel can be used as a sauce or for dipping apples. There’s nothing like a luscious drizzle of caramel to finish a dessert or beverage. When making caramel at home, I love to try different flavor pairings to fit the seasons. Over the years, I’ve made Lemon-Scented Caramel in the summer, Spiced Salted Caramel in the winter, and Apple Cider Caramel in the fall. With the warm aromas of cinnamon, brown sugar, and sweet-tangy apple cider, this twist on a classic gives caramel a decidedly autumnal flair. It’s one of my favorite seasonal indulgences. Boiled Cider: Easy to Make at Home! To make this Apple Cider Caramel, we first need to make boiled cider. To do this, all you need is a pot, a jug of your favorite sweet apple cider and about 30-60 minutes (depending on the pot you’re using). Boiling apple cider gives it a syrupy texture and concentrated flavor. We’re boiling 4 cups all the way down to 1/2 cup, so you can imagine that the flavor of the cider intensifies! Boiled cider brings a wonderful dimension of tartness and apple flavor to the caramel. The process is pretty hands-off, but you’ll want to watch the pot especially closely toward the end of the cooking process so the cider doesn’t burn. You’ll know you’re getting close when the mixture is quite bubbly, almost foamy, when stirred. When I make traditional caramel, I usually do a lot of judging by eye as it’s cooking. I tend to know the shade of toffee I’m going for, even before my thermometer tells me it’s ready. Since Apple Cider Caramel starts off with a caramelized tone from the boiled cider and light brown sugar, it’s difficult, if not impossible, to know how the sugars are developing by color. Instead of following the more classic caramel-making technique of adding cold heavy cream toward the end of the cooking process, I simmer this caramel with the cream from the start. While with this technique, you won’t get the violent bubble that you expect when adding cold cream to hot caramel, it’s best to use a heavy-bottomed pot with high sides for this recipe. It will bubble up as it cooks, just not as abruptly. Since we can’t judge the cooking process by eye, you’ll need a candy thermometer, or instant-read thermometer to make this caramel. 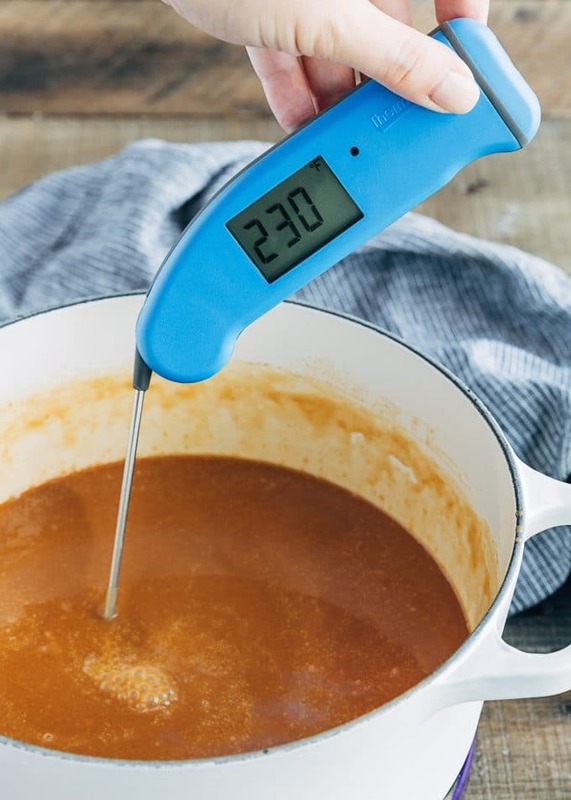 The desired temperature will depend on how you’re using the caramel. 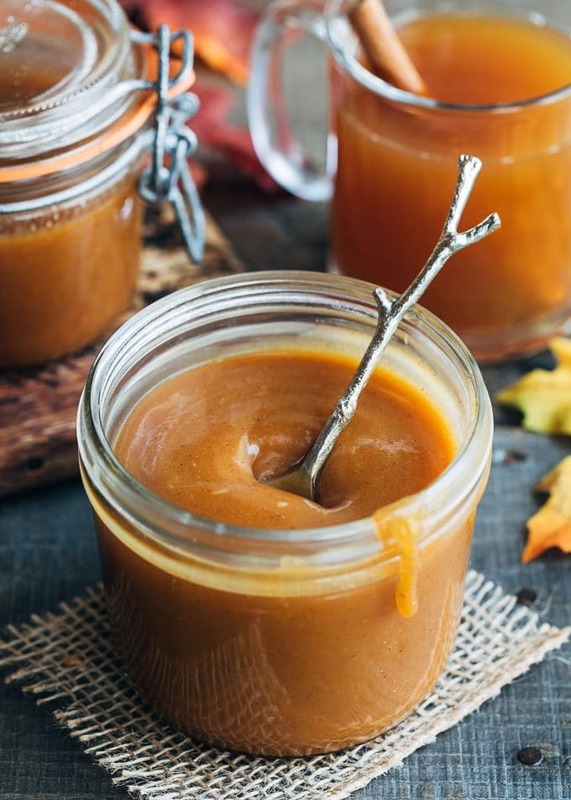 If you’re using it as a sauce, you’ll want to cook the apple cider caramel to “Thread Stage,” about 230 degrees F. If using it to dip caramel apples or make candies, you’ll need to cook it to “Firm Ball” stage, 245-250 degrees F. The hotter you cook the caramel, the harder it will solidify as it cools. How Should I Use Apple Cider Caramel? After you resist the temptation to eat it straight from the jar with a spoon (I swear, I would know nothing about this personally! ), there are some pretty delicious ways to use this Apple Cider Caramel. As I suggested earlier, you can use it to make gourmet Caramel Dipped Apples that will wow your family and friends. Used as a sauce, Apple Cider Caramel is delicious drizzled over desserts, like brownies or homemade apple pie a’la mode. I also love it as a filling for macarons. In truth, you can use this recipe pretty much anywhere you’d use a traditional caramel sauce or dip. The possibilities are as vast as your caramel-loving heart can imagine! Rich, sweet, and slightly-tangy apple cider caramel, made with reduced fresh apple cider and a hint of cinnamon. This is the perfect caramel for fall! Bring apple cider to a boil in a heavy bottomed pot. Reduce heat to medium/medium-low to maintain a steady bubble, and cook until cider is reduced to 1/2 cup, about 30-60 minutes. Stir occasionally and watch it closely toward the end so it doesn’t burn. Strain reduced cider and return to a clean pot. Stir in light brown and granulated sugar, salt, cinnamon, and heavy cream. 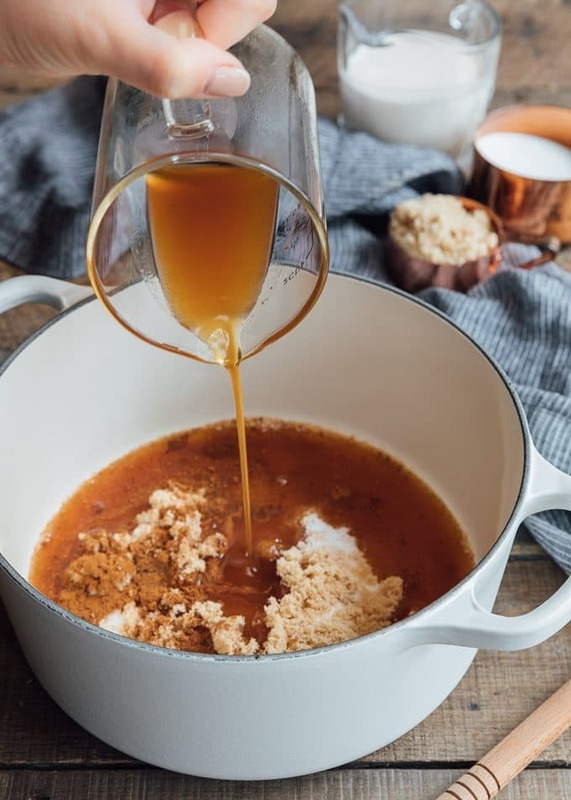 Bring to a boil and cook over medium-low heat, stirring occasionally, until the caramel reaches 230 degrees F on a candy thermometer for caramel sauce, or 245-250 degrees F for dipping apples. Caramel will thicken as it cools. Store, covered, in the refrigerator for up to one week. I like to store my caramel in a microwave safe container, so that I can easily warm it back to a pourable temperature by heating in 10 to 15-second intervals. Caramel cooked to the temperature for sauce will thicken in the refrigerator, but still remain pliable. Caramel cooked to the temperature for apple dipping will solidify. If making ahead for apples, be sure to store the caramel in a microwave safe container. Warm in 15-second intervals at half power, until the caramel is fluid again. I made this the other day after you posted the recipe on Instagram and oh my gawd! We’ve been putting this caramel sauce on everything.